Angampora dancers keeping the crowd entertained. While the vast majority of the protestors left Colombo Fort by 8PM yesterday, a small group remained behind for a Satyagraha on Lotus Road outside the Colombo Hilton. The rally organisers got Angampora dancers to keep the small crowd entertained during their vigil. There were also skits by men in demon-masks and other activities for the vigil-keepers. Former President Mahinda Rajapaksa also arrived briefly on the scene, while former Ministers Mahindananda Aluthgamage and Bandula Gunewardane were seen leading the crowd at 9.30 PM. 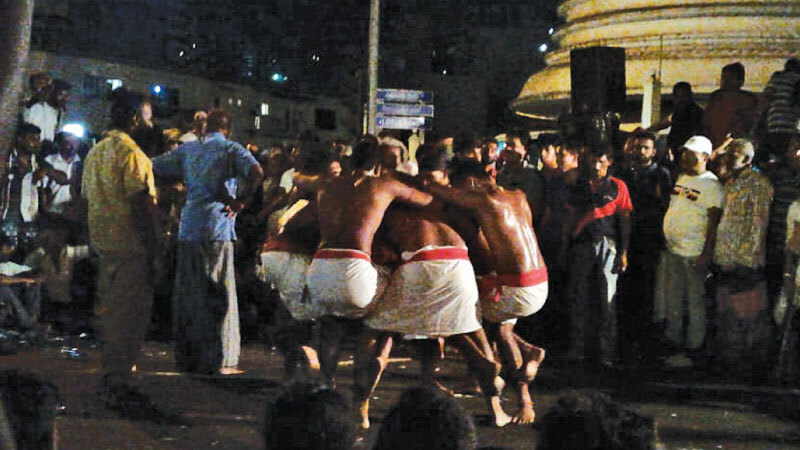 JO MP Bandula Gunewardane told Daily News that the crowd would remain on the road till about midnight or 1AM. “Today was just the pilot project,” he added. Meanwhile, the Government alleged that SLPP leaders had booked rooms at several five star hotels in the vicinity including the Hilton Colombo, Taj Colombo and Shangri-La. Deputy Minister Nalin Bandara told a press briefing at the Government Information Department last night that a Suite of the Taj Colombo had been booked, while other sources confirmed that presidential suite had been booked for JO/SLPP MPs. 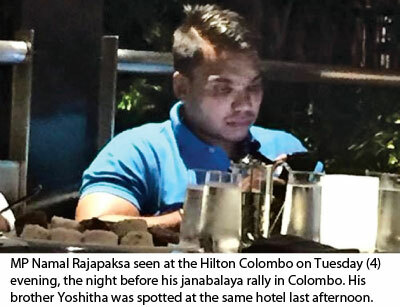 Namal Rajapaksa was spotted at the Hilton Colombo on Tuesday (4), the night before the janabalaya demonstration, while his brother Yoshitha Rajapaksa was spotted in the Hilton lobby last afternoon, enjoying a beer with businessman Nimal Perera and Gamini Abeyratne, aka, ‘Taxi Abey’ before joining the demonstration.